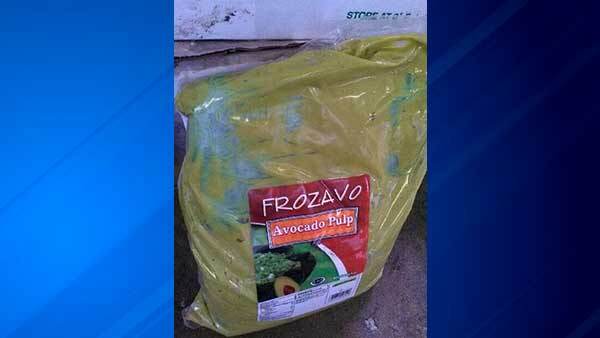 More than a ton of marijuana was discovered in a shipment of frozen avocado pulp, Cook County Sheriff Tom Dart said. LYONS, Ill. (WLS) -- More than a ton of marijuana was discovered in a shipment of frozen avocado pulp, Cook County Sheriff Tom Dart said. Members of the Sheriff's Street Crime Suppression Unit seized approximately 2,100 pounds of marijuana last Wednesday after a suspicious delivery was reported at a cold storage facility in Lyons. They said the shipment had instructions for "urgent pickup." Sheriff's police said a narcotics-sniffing dog detected drugs inside the shipment. Police searched more than 1,500 boxes and discovered marijuana packed in flat bricks and covered in avocado pulp. Police said the drugs have an estimated street value of $10 million. The U.S. Drug Enforcement Agency and sheriff's police are investigating.